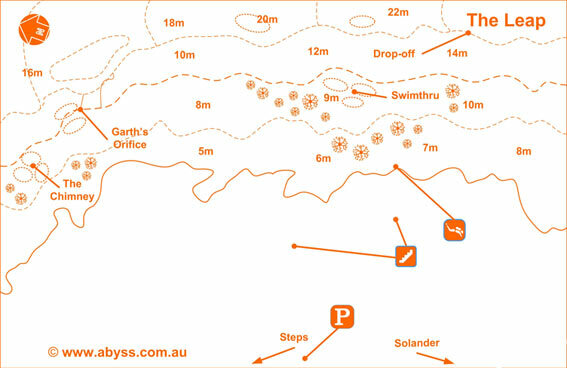 After entering, swim on the surface for about 50 metres and descend into around 10 metres, heading northeast until you reach a distinct drop-off that meets the sand in 22 metres, populated by boulders and overhangs. Head along the wall in a general westerly direction until you reach a narrow rock canyon with a sandy floor. It ascends to about 16 metres, meeting a broader gully. Follow this and be on the lookout for a neat swim through on your right. From here you can meet up with the sand line which will lead you into the vicinity of the Steps site (depending on your air consumption, you may prefer to head to the 5 metre mark with a dense line of boulders just on your left (to the south)). Eventually the rock will be replaced by kelp, which abruptly stops (at about 8-9 metres) leaving an expanse of sand that leads right up to the shore-line boulders in the 5 metre mark, before resuming about 30 metres onwards. This is your cue to head to the shore. See the Steps site for exit details.